Click Image to Download FREE eBook! If we learn to transform our mind through meditation, then we can transform our life. Everybody needs to be good-natured with a good heart, because then we can solve our own problems as well as those of others, and we can make our life happier and more meaningful. 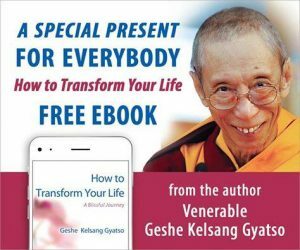 This series of drop-in classes will be based on the book How to Transform Your Life by Venerable Geshe Kelsang Gyatso. This practical manual for daily life shows how we can develop authentic inner peace, overcome daily problems and bring about positive changes in our life, that enable us to experience deep and lasting happiness. Everyone welcome! **Bonus! Attend Real Inner Protection: A Weekend on Love with Internationally Renown Meditation Teacher Gen-la Kelsang Khyenrab and get a special package deal for you and a friend to kick off the series. Perfect way to spend Valentines Day!